We are delighted that NZCER will be hosting the first NZ Book Group in Connected Educator Month this year. 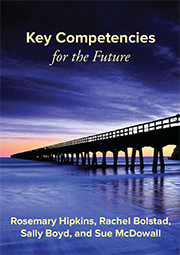 The new publication, Key Competencies for the Future, will be spotlighted through webinars and online discussions. This is a wonderful opportunity for educators across New Zealand and beyond to come together online to talk to the authors and explore the themes in the book. Join Sally Boyd, Rose Hipkins, Rachel Bolstad and Sue McDowall as they share their thoughts on this popular new publication. Brought to you with the support of Microsoft, our National Connector partner. Today, we had a wonderfully rich discussion and exploration through three key themes of the NZCER book this morning with Rachel Bolstad, Sue McDowall and Sally Boyd. The webinar is now archived on the Connected Educator website. We touched on the challenge of educating for the future. School is supposed to prepare learners for their future lives… “Creative, energetic, enterprising...confident, connected, actively involved, and lifelong learners…”(NZC vision). But – to what “futures” might they need to employ and apply these attributes? We can’t “see” the future. There is no data from the future. Research can help us to think about what the future could look like. But we also need to consider what we want that future to be. The key competencies, at the heart of the curriculum, might provide a fresh way of asking future focused questions about what today's learners need if they are to be ready for life beyond school. In the book, the authors start with a "wicked problem" and explore the ways in which key competencies can become a vehicle to help learners explore, inquire and take action in response to that problem. Why might it be useful to design learning around "wicked problems" as a starting point for helping our learners develop key competencies? How might different competencies provide a doorway through which our learners can relate to and explore learning areas and new ideas? Can you share examples of approaches you are planning or have trialed with your own learners? The authors will be dipping in and out of this thread to answer questions and share thoughts of their own - and we would love to hear from you as you explore this book. So, as I said in the webinar, this theme is probably the most mind-stretching one in our book but if you have read it already, you'll know that we quite like to jump in at the deep end and encourage others to do so too! One of the big ideas in the book that we experimented with was this - how can we construct a plausible "line of sight" between some of the complex real-world challenges facing our societies, and the everyday learning and teaching opportunities that could support young people to develop and express the kinds of competencies that would be necessary to effectively engage with complex challenges? This is an idea that I'm very interested in - as school learners we're always told that what we learn will be useful for us in the future, but is this really true - are school learning opportunities intentionally designed with futures in mind, and if so, what notions of the future underpin our educational planning and design? In Chapter 2 of the book we explain how we used the idea of wicked problems almost as a thought experiment in how we might link our own understanding of key competencies, and the conditions that can effectively scaffold students' learning opportunities, to a wider view of the world and the big issues of our time and the possible futures that will result from "our" (humanity's) decisions and actions in relation to issues like these. How "we" deal with these challenges will be part of what determines the kinds of futures that we and our young people will face. Is your mind feeling stretched already? One of the most common questions we get is "well what does this look like in a classroom [like mine]?". This is why we put in a diverse range of examples from practice in the book - but perhaps you still can't connect these examples with your own context? This is the tricky part - there are so many possible ways teachers could work with these kinds of ideas in relation to their discipline, or in relation to the particular students or community they work with. I am certain there are some really interesting examples out there waiting to be shared - so if you can tell us what you are doing or trying we will all be the more enriched by our discussions around this book! In the webinar I pointed to Steve's blog and Reid's blog as an examples of a secondary and primary teacher respectively mulling over some of these ideas about wicked problems as a frame for learning design. I really encourage people to read these and hopefully we might get to hear more from them at the wrap-up webinar on Oct 23rd! In the opening webinar someone asked a question along the lines of - these ideas are so big, where do we start? My answer for things that are very hard and you don't know where to start (this is basically my life every day, so I do honestly know how it feels) is to just start somewhere, and start talking about it. So - where are you starting? Hi Book Group. My name is Kerri and I am very interested in the discussion about this book. I did have some conversation this morning on Twitter with you Rachel and Reid and appreciate you answering my questions. What you say above Rachel struck a chord .. that 'as learners we're always TOLD that what we learn will be useful for us in the future'... whenever I am discussing Learning Intentions with my students, this is what the students TELL me when I ask the question 'why' are we learning this?' I then ask them to elaborate and tell me HOW it will help them in the future. Anyway... I think the best place for me to start will be to ask my students "who decides what you learn in school?" or something along those lines (what you suggested via Twitter this morning). I will see where this takes us! I am looking forward to the discussion AND QUESTIONS which arise from this. I will hopefully find the whole thing becomes organic and develops on its own! I will keep the group informed on what happens! Look forward to hearing more Kerri. We once asked these questions with a couple of groups of year 9 and 10 students at two schools, as described in this report. At that time we were specifically interested in how to engage students in thinking about curriculum (where does it come from, who shapes it) and how ideas and practices in schooling change over time. One idea they came up with was to interview a peer, a parent, and themselves about school in the past (how did it used to be), how it is now (what do each of those people think is different about school compared to in their parent's or grandparents' time), and how does each think it might be in the future. That project also culminated in the students presenting their work to staff meetings and/or to evenings where parents and staff were invited to hear what the students had been doing. The project gave us some useful insights into working with students around these sorts of questions, as well as challenging us to think hard about our own purposes/agenda for doing so! This book is critically important and should be compulsory reading along with the NZC. All students need to be change agents: This is especially true for those students who care intensely about social and environmental issues because they can become overwhelmed and hugely distressed by the immensity of issues they're exposed to every day. These are often the students that impress teachers with their heartfelt reactions to novels and activities that address significant issues - what the teacher can't see is the turmoil that continues to plague many of these children beyond the duration of the unit of work. Quite apart from the real-world learning that takes place, being 'part of the solution' helps these children address this intensity by making a contribution. The Starfish Story is a great way to introduce the notion of being part of the solution in a manageable way. Although videos of the story are available, I find students engage more when I tell, and act it, myself. As a PLD provider for the last four years, I don't have access to my own classes now but the Te Ao Whanui class website provides an example of one way of engaging students in complex local real-life challenges based on the last Year 10 class I taught (in 2010). The learning programme for the year centred around the name of the class 'Te Ao Whanui.' Although the theme of 'Local Participation and Global Confidence' was the same for all 29 students, each of them could choose their focus for learning, design how they would weave strands and learning objectives into their personalised learning activities and how they would show what new learning had occurred (as opposed to simply showing the product of their learning). While learning was personalised, it was also collaborative, in that students worked within, and across, their project-based groups to learn from and with each other. Formative assessment was individualised as was the assessment for those students who opted to 'have a go' at a Level 1 Achievement Standard (all passed including two with Excellence and four with Merit). Although it's not obvious on the class site, all groups completed the projects, and their achievements far exceeded their own, and others', expectations. While the site quickly became inactive as a place for writing when the year finished, the learning and principles underpinning this way of working remained with the students beyond their time in this class. Resources used for the learning programme are available in Curriculum Stories (archived). I wouldn't use these in the same way again, especially since there is so much more available to students now, but many of the ideas underpinning the programme remain relevant (for now). I look forward to hearing others' examples and ideas of how to make these important principles active in learning at all levels. Thanks for those links and stories Anne! I can definitely relate on a personal note to your first para because I was one of those kids when I was at school. Learning more "about" the world and its challenges nearly had me abandoning all hope for the planet and the human species by my late teens - true story! It's easy to feel overwhelmed and I can tell you for sure I held on to the depressing facts long after "the unit", like some of your students. I think it's so important to build young people's sense of hope and power in their ability to get involved even if in a small way. Keri Facer talks about the idea of "educated hope" or "non-stupid optimism" - I think we all need some of that in order to take on the hard stuff and not be defeated by it. Quiet week so far - I'm wondering who else will jump in and join the conversation? Hello to all of you book-groupers who might be at ULearn this week - if you are, go say hi to the friendly folks at the NZCER booth. Key Competencies For The Future is of course available there too. What a mind stretcher! Hats off once agian to the NZCER team, I love the way you write and express your thoughts and ideas. Truthfully, adressing the key competancies has been something of a 'tick-box affair' for the science learning area. I think our understanding of the key competancies is still too superficial. We have been doing much in designing a local curriculum (Y9 & 10) and are certainly making honest and genuine attempts at tackling 'wicked problems'. Add to this the fact that we are seeing a change in our content and to a lesser extent pedagogical delivery with the use of BYOD. Nearly all of our Y9 curriculum is now Moodle accessible! Our wicked problem solving has involved different inquiry approaches and this is where the key competancies are really surfacing! I can see and feel students grapling with the complexity of the issues and it is tough both cognitively and emotionally. But it is also a lot of fun and there is a real sense that what we are doing is meaningful and counts for 'something'. Example ... Y9 students last year exploring the Antarctic toothfish fishery in the Ross Sea. We began by watching the NZ produced activist movie 'The Last Ocean' firmly against fishing. A hook that got many students suitably riled. But then to delve deeper. Is the harvesting of toothfish having or is going to have a measureable/detrimental impact on the rest of the ecosystem? In come the NIWA team with their expert fishery advice. Lets compare fishing strategies of the toothfish with other commercial fisheries - how do they compare? What is a precautionary approach to fishing? What does a catch limit of 3000t of toothfish look like? And CCAMLR with strangely, both a conservationary and controlled extraction role - a real tension here! A burning question for us: do killer whales rely on toothfish as a major part of their food scource while they are in the S Ocean? NIWA got to back to us with an answer: they don't really know and are talking with US Scientists to explore this question further. Our class thought of some creative ways to investigate this question. In brief ....maths joined us to explore the tag and re-capture element of fisheries work. Social science looked at perspectives and science, ecosystems. The upshot ... well there was a lot more that I have not commented on and it all became wonderfully messy. Too 'hard' for Year 9? A massive cognitive challenge certainly. Importantly, I declared from the outset that I did not know the 'answer' so was embarking on the journey too! I was able to model different lines of questioning, confess to not having expert knowledge in areas of my own 'specialist' subject - science. Recognising that science did not have THE answer but could only inform based on best evidence. We finished with a debate. One of the intended 'assessment products'! I failed quite miserably in trying to assess this and quite frankly, happily gave up trying. Students 'judged' who had made the best points. So we were swimming around in key competancies! I have more of the book to read and I know this is going to help me in developing my own and students capabilities. I'm enjoying reading Key Competencies for the Future, now downloaded onto my iPad and I have also enjoyed the conversations posted here too. It is important that we do pose 'wicked problems' for students to consider. Well crafted lessons and content are the starting point for this, but allowing the flow to be at the students' pace and direction is important too. I can share an example my husband shared with me. He was working on the film Welcome with his high school English students. Briefly, a young Kurdish-Iraqi illegal immigrant is hiding out in France and trying to make it through to England to meet his girlfriend, whose family have been accepted into England. So many questions came from the students after watching the film - 'Why couldn't he just go to England?' 'What was stopping him?' 'Why do countries have borders?' and finally 'Who decides who is welcome and who is not?' This latter being a perfect example of the wicked problem - "highly complex, uncertain, and value-laden"1. Knowing when to dispense with a set program and allow time for the students to talk about, think about and pursue these questions further is crucial and one that some teachers might find difficult to do in a time-driven and assessment laden program. I am also enjoying these conversations and have just listened to the webinar as I missed it in real time. Unfortunately I don't have a copy of your book. However I love the concept of 'wicked problems' as they sound very similar to the 'global' themes and transformational teaching that I was encouraged to use in a 'Critical Literecy' course that I studied at Auckland University about 6-7 years ago. One benefit of using such themes is that they are very inclusive. All students have knowledge that they can contribute and bring to the classroom conversation. This is very important as our classrooms become more diverse in their composition. I was just beginning to explore and grapple with how I do this as a classroom teacher when I moved out of the classrrom. I know that as an individual teacher grappling on her own that this was difficult to get my head around. I felt overwhelmed by the enormity of the change and the huge possibilities that it opened up. I wanted to change everything at once yet knew that my colleagues weren't ready to follow. It came down to what can I do in my individual classroom and taking small steps to begin the process. Letting the students led the learning and in the process encouraging them to transform their own community /world was a huge challenging but so exciting. It was a shame I wasn't around longer to see where we ended up. I think it would be much easier if my school leadership was on board and the process was something that the whole staff was involved in. Janet I hope you can get hold of a copy! Picking up on your point, I am interested in people's thoughts on the point you made that even though you were exploring new approaches and practices your colleagues "weren't ready to follow". A whole-school approach and perhaps a sense of an environment where it is OK to take "risks" and try new things (and learn from what goes well and what doesn't go well) could be a start - what else is needed, do you think?